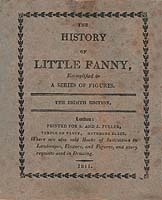 "The Fullers were primarily manufacturers of toy novelties, but feature largely in early history of the movable book because of their invention of Paper Doll Books, the most famous of which is certainly The History of Little Fanny issued in 1810. . . . The idea [of paper doll books] was certainly ingenious, and it is perhaps no surprise to find that the Paper Doll Books were expensive even for the period, selling at between five and eight shillings each." Click on Little Fanny to dress her in three different outfits! If you don't have it already, you will need the Shockwave Authorware plug-in. Contains six full-page color plates with moving parts operated by tabs. Fun at the Circus. London: Raphael Tuck & sons, [1892?]. "One of the first men seriously to challenge the pre-eminence of the Dean company in movable books was a German, Raphael Tuck (1820-1900). . . . 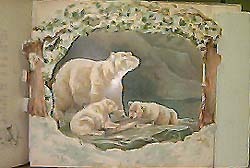 He saw the opportunity to move into the children's book market with volumes of high pictorial quality and outstanding production. To produce his books he formed editorial and design studios in London where he employed men of undoubted talent, but took all his printing to Germany." "Tuck's books were colourful and imaginative, catered for young and old alike, and covered topics ranging from ancient myths to contemporary events. In 1875 he became a naturalised Briton, and in due course his outstanding skills were recognized when he was appointed Publisher to Queen Victoria." 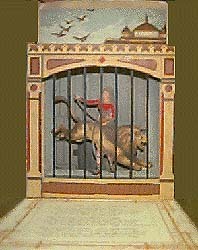 Ernest Nister was one of the most well-known and innovative makers of movable books in the late nineteenth century. He began his company in Nuremberg, which was then a center for toy manufacturing. After producing several movables for the German market, Nister opened a London branch, where translations were prepared for a British audience. Nister soon expanded to America, where Dutton in New York promoted and distributed his books. 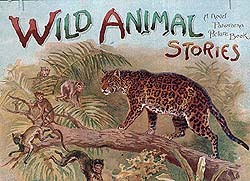 Wild Animal Stories: A Panorama Picture Book. London: E. Nister; New York: Dutton, . Pictures to Please You with verses by Clifton Bingham and pen and ink sketches by A.G. London: Ernest Nister; New York: E.P. Dutton, [1890?]. The Lion's Den. 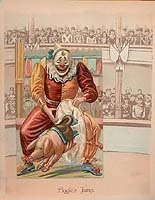 Little Showman's Series (First Issue). New York: McLoughlin Bros, [ca. 1880]. Because you've spoilt you fun. 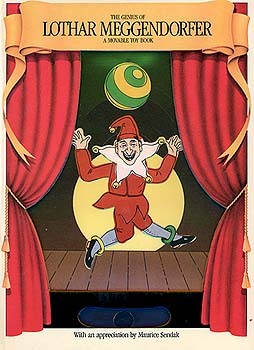 Meggendorfer created an estimated two hundred books, and his often humorous approach delighted both children and adults. 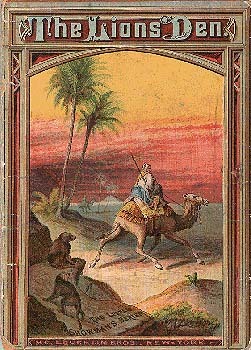 Today, his original books are extremely sought after and valuable.